Honored with two Associated Press Awards for Best Weathercast, Don Schwenneker is a meteorologist for ABC11 Eyewitness News in the morning. He holds the Certified Broadcast Meteorologist seal from the American Meteorological Society as well as a Seal of Approval from the National Weather Association. Don joined Eyewitness News from Chicago where he served as a meteorologist for WBBM-TV. Prior to that, Don worked for WTAE-TV in Pittsburgh, and WTAJ-TV in Altoona, Pennsylvania. 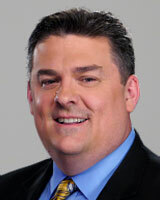 He began his weather career over 20 years ago as a lead forecaster for KBIM-TV in Roswell, New Mexico. As for his moniker, "Big Weather," Don was given that nickname by a colleague for two reasons. First, he's 6'5" and one of the taller meteorologists on TV. Second, during big weather events from tornadoes to flood warnings, Don was always on TV. So whenever there was big weather in the forecast, "Big Weather" was on TV. And the name has stuck ever since! Don's family comes first in his life. He's married and has three children. He was also a volunteer firefighter for 7 years in Pennsylvania. He is a certified rescue technician & first responder. In addition to firefighting, Don's public service includes Police, Fire, and EMS dispatching and national certification as a 911 call-taker/dispatcher. Check out Don's blog Losin It with Big Weather. Request Don to speak at your event. A storm system and an associated cold front that have been responsible for severe weather across the Gulf Coast states Thursday will continue to move east Friday and into the Carolinas. Here we go again. A winter storm brought thunder with it, so everybody starts saying it's going to snow in the next 10 days. But is that old saying based in scientific fact? There may be plenty of sunshine in the forecast but that won't stop the Arctic front from sweeping through. If your job involves working outside in cold weather, here are a few things to remember while Old Man Winter pays a visit. It is another brutally cold morning out there for us in central North Carolina. So, if it is so cold out, why isn't there always frost or ice on your car in the morning?